Ask questions. Share. Learn together. Welcome to TINYpulse! You're probably reading this because you've received an invitation to TINYpulse in the form of a survey and are wondering what to do next. Good news is, you're in the right place. TINYpulse is a third-party suite of tools designed to improve transparency, foster two-way communication between employees and leaders, and leads to a happier workplace. Your leaders have purchased this platform for your company and signing up grants you access to powerful, feedback-giving tools, that you'll be able to use from your first day to your last. If you're a new employee at your company, you'll start out by receiving four TINYpulse Onboard pulse survey questions about your experience as a new hire within the first 90 days at your new company. But you're probably wondering, "What's a pulse survey?". TINYpulse invented the idea of a pulse survey in 2012. It's a one question survey, sent at a regular interval, to collect your in-the-moment feedback on a number of issues like your overall happiness in your role, your thoughts on leadership, training and develipment, transparency, and more. 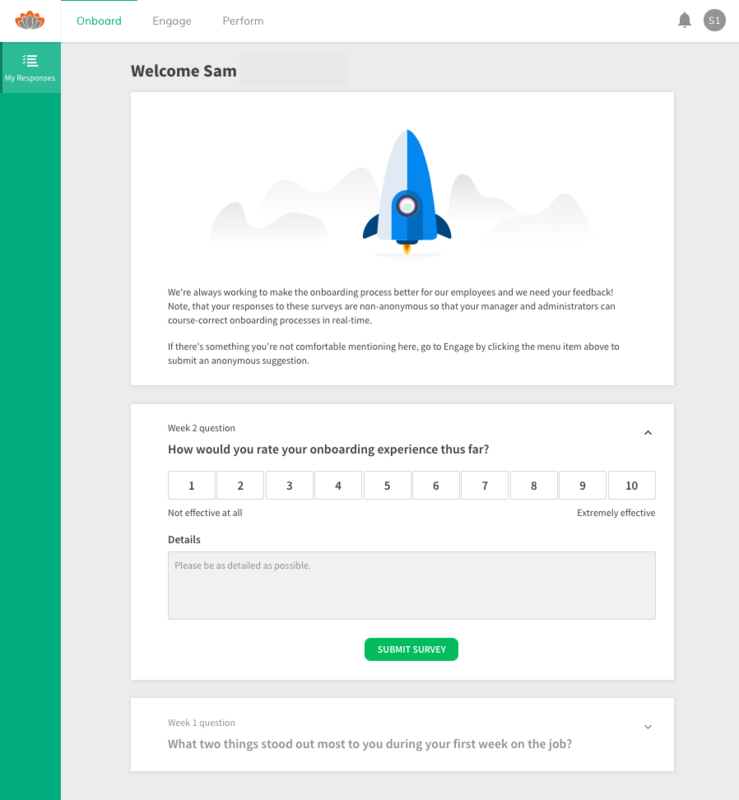 As a new hire, you'll receive four pulse surveys specifically about your onboarding experience within your first 90 days on the job. Pulse surveys open up lines of communication between employees and leaders which may have never existed before. They are a doorway to dialog, and you're encouraged to give your open and honest feedback because your leaders care about your well being and making organizational changes for the betterment of everyone. TINYpulse offers two types of pulse surveys, non-anonymous new hire surveys with Onboard and 100% anonymous long term engagement pulses with Engage. You'll start out by receiving non-anonymous surveys as a new hire, and then will eventually transition to 100% anonymous pulses with Engage. Onboard surveys are non-anonymous to help build the foundation of the relationship with you and your manager. You manager and administrators will be able to view your feedback and work with you directly to ensure you have all the tools and training you need for success. See the last section in this article for more information about the 100% anonymous pulse surveys you'll eventually receive from TINYpulse Engage. Once you receive an email from happiness@tinypulse.com, it will come with a survey question as pictured above. Click the button in the email to complete sign up and respond. Enter your first and last name, verify your work email address, and set your password. Click Submit to continue on to the survey. Once again, you'll receive four pulse surveys specifically about the onboarding process and the training your received as a new hire with TINYpulse. They'll be sent to your email inbox after your first week, second week, fourth, and twelfth weeks on the job, so you don't have to worry about checking the TINYpulse app for a new survey. We'll let you know when they're open! And if your company uses Slack or Microsoft Teams, your survey will be delivered directly to those apps where you can respond without even having to visit TINYpulse. Keep in mind that the more detail you provide with any pulse survey, the better. Pulses are also meant to be quick so take 5-7 minutes to provide a thoughtful response to the single question, and then you're done until the next one comes a week, or two, or four later. Quick and simple! Responding to your new hire pulse survey is just the first step. You can also use LIVEpulse to send your administrators an anonymous suggestion, or send a Cheer to recognize someone who went out of their way to help or welcome you into your new role. Just click the Engage in the top horizontal menu, and then the (+) in the upper right to send a Cheer or give a suggestion. TINYpulse is designed to allow employees to give feedback all throughout their time at a company. 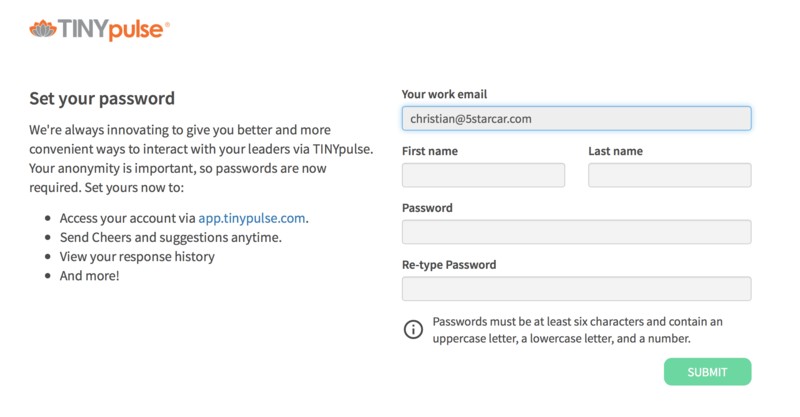 After you've received the third onboarding pulse survey, you'll start receiving a different set of surveys though a tool called TINYpulse Engage. The beauty of TINYpulse Engage is that it's 100% anonymous. Engage asks deeper questions designed to uncover any underlying cultural issues, and TINYpulse provides a safe place for employees to give their open and honest feedback without fear of repercussion. Keep an eye out for an Engage survey in your sixth week at your new company. It will still come from happiness@tinypulse.com, but the questions can be about any topic under the sun. Some examples include "How happy are you at work?" and "Is your career path clear to you?." The emails also look a bit different, as pictured below with the TINYpulse Engage logo at the top.